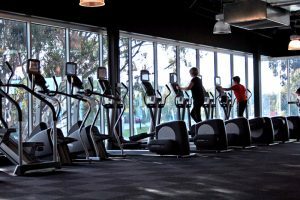 While living in the Southeast or Lakeshore dorms, you’re mere footsteps away from a decent gym. That’ll change. When considering your sophomore year living situation, many freshmen assume, as I did, that you’ll continue utilizing the Serf or Nat for your exercise needs. You won’t. My sophomore year I lived in Grand Central, one of the closest apartment buildings to the Serf. I exercised nearly everyday as a freshman, but that quickly changed when I wasn’t living fifteen feet away from the gym. Walking five or ten minutes to the Serf from my sophomore year apartment was a constant struggle, especially during the winter when it takes five minutes just to get all your winter gear on. As a result, I hardly ever went to the gym. Any freshman fifteen I gained, I gained as a sophomore. If you workout consistently, I highly recommend finding an apartment with a gym for your sophomore year. Many buildings have gyms, including Lucky, the Towers, and 229 Lakelawn. I was fortunate enough to live at the Hub, which has a high end gym and spa on the second floor. This meant I had absolutely no excuse for getting in my gym time. The only thing between me and a treadmill was a 5 second elevator ride. Some may argue that a nice run or walk to the gym is just part of your workout. That may be true when it’s not twenty degrees out and you’re in a parka down to your sorrels. Unfortunately, in Madison that’s rarely the case. In an effort to avoid these outings and the potential runny noses that follow, you’ll almost always opt to stay home. The solution? An apartment with a gym!